Today, before each of us, an empty calendar lies open, a tabula rasae on which we compose our lives. After a moment of reflection of the past 12 months, it is time to look forward to 2017 and perhaps set some personal goals. Inspiration for my 2017 goals comes from Margaret Bolsterli, an 85 year-old retired professor I met in October 2011 during my stay at the Writer’s Colony in Arkansas. At the colony, each evening, the writers met for dinner. Each night after the others had retired to their rooms, Margaret would tell me a story. She knew nothing of my life and yet each tale went directly to the heart of things. I became King Shahriar mesmerized by the tales of the Princess Sheherazade in Arabian Nights. Margaret wove compelling tales. During my stay, I read Born in the Delta: Reflections on the Making of a Southern White Sensibility, in which she describes growing up in the Arkansas Delta during the 30s and 40s and how she unflinchingly confronted racial conflicts, violence, the Confederacy, and her own family secrets. 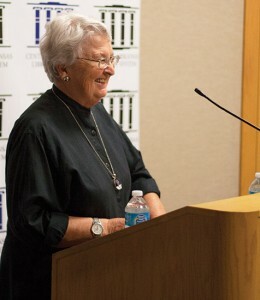 Margaret taught Women’s Studies at the University of Arkansas for 25 years, educating not just individuals but families. A woman or man would take her class and send their sisters who would recommend the course to their aunt or mother. Generations of students received inspiration from Professor Bolsterli. One evening, she told me of her interview with 94 year-old Lily Peter, a tale quite appropriate for this time of year . . . of revolutions and resolutions. Margaret was 57 at the time. In the interview, Lily described life at the turn of the century outside Marvell, Arkansas, of attending college and becoming a teacher. She dreamt of leaving home but her father died and she remained at home and put her brother and sisters through college. During the Depression, the siblings worked, pooling their monies to buy land and a cotton gin. For 30 years, Brother ginned cotton on the family’s two plantations while the sisters taught school. Upon Brother’s death, however, Lily, now 60, discovered that the family was in serious financial trouble. She again took the bull by the horn and announced to her sisters that she would devote the next 30 years to making the business solvent. Would you like to hear, as Paul Harvey would say, “the rest of the story”? At age of 94, Lily retired to devote herself to writing poetry and became Arkansas’ Poet Laureate. At 98, she decided to get her Ph.D. and called Margaret. Margaret arranged everything: a residence, a wheel-chair ramp, classes in one building. Everything was set until Sara’s physician forbade her to go. Shortly after, Sara died. Margaret walked into her department and looked around. Here were the same people she had worked with for 25 years, the same walls, same office. Like Lily, she decided a career change was in order: “I think I’ll try my hand at cattle ranching.” She bought a farm. Soon after, she retired, and began raising cattle and riding horses. She did that for 20 years before moving on to her next adventure. Are you considering a new adventure in 2017? Perhaps taking a turn at farming, going back to school, learning a new sport, hiking and camping in the great outdoors,Learning about Spanish cuisine or how to grill, making Caswell County a better place to live? No matter what your age, just do it. Lily wouldn’t hesitate (and neither would Margaret).